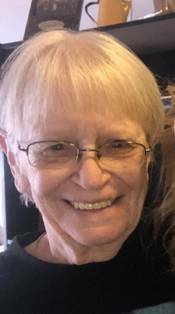 Cheryl A. Kvien, 69, of Hawley, MN, went to be with the Lord with family by her side on February 4th, 2019 at Sanford Medical Center in Fargo, ND. Cheryl was born March 18, 1949 in St. Paul, MN and raised at Greenbush, MN by her loving parents Samuel and Laura Shafer. Cheryl attended Greenbush School and graduated in 1967. She was baptized and confirmed in the Catholic faith. Cheryl lived most of her life in the Greenbush-Badger area where she raised four children and lots of animals. She recently moved to Hawley, MN to be closer to grandchildren. Cheryl's pride and joy were simply her kids, grandkids, and friends. When the house was full laughter was loud, smart comments were plentiful and the love was endless. Cheryl had a green thumb like no other, bleeding hearts her specialty. She was always proud of her many gardens. When it came time to downsize she took her "garden" with her, this time as potted plants. She loved simple conversation. It didn't matter if it was talking about Jesus, cooking, gardening, family, friends, past or future times. She had a great sense of humor and loved nothing more than to make people laugh. Always the card shark, many wonderful years were spent gathered around a table dealing whist, pinochle, gin rummy, and rummy. You name it, if it involved cards, she played it. Cheryl was never known to turn down any board games, she was such a competitive little rascal. Her handmade gifts such as crocheted slippers, doilies, hanging kitchen towels, and potholders are proudly displayed in loved ones' homes. If she could get her hands on a pattern, she would try to create anything. Sending a birthday card, thank you note, or just a simple ‘thinking of you’ card was important to her. To say Cheryl's faith was strong would be an understatement. If she was unable to attend church in person you can bet she would watch mass on TV. St. Andrew's Catholic Church in Hawley, MN recently became a place of peace and fulfillment for her. Recently upon leaving church, Cheryl said “Oh I just love going to church. Once I have Jesus in me, I never want to go without.” “Hail Mary, full of Grace” blessed her lips every day. Her St. Jude prayer card and keychain were always with her wherever she went to encourage her through difficult times. The next time you see a deck of cards or hold a Rosary in prayer remember that spitfire of a little redhead. She is survived in death by four children; Darick (Bonnie) Kvien of Milaca, MN, Danny (Connie) Kvien of Felton, MN, Aaron (Meghan) Kvien of Greenbush, MN, and Aimee (Steve) Burkel of Hawley, MN; 12 grandchildren; Shelby Wicklund, Jackson Kvien, Morgan Kvien, Charlie Kvien, Cooper Kvien, Cole Kvien, Landon Kvien, Lauren Kvien, Benjamin Burkel, Samuel Burkel, Kate Burkel and Laura Burkel. She is also survived by three siblings; Dean (Diane) Shafer of Strathcona MN, Nancy (Duke) Reed of Lansing, IL and Mary (Karl) Kjersten of Greenbush, MN; many nieces and nephews and extended family. She was preceded in death by her parents Samuel and Laura Shafer, brother Alan Shafer, infant sister Darlene, sister-in-law Polly Shafer and grandson Chase Kvien. Funeral services were held Monday, February 11th, 2019 at 10:30 am at Blessed Sacrament Catholic Church in Greenbush. Father Pat Sullivan and Father George Noel officiated. The Reader was Jan Burkel, Music was by Jeanne Novacek, piano and Darcy Hasson, vocalist. Eucharistic Ministers were LeRoy Omdahl and Jan Burkel. Pallbearers were Vernon, Kent, Ray, Joel, Jarod & Patrick Shafer. Honorary Pallbearers were Kelly, Kevin & Kian Kjersten and her grandchildren. Burial will be in Blessed Sacrament Cemetery in the spring. Arrangements with Gieseke Funeral Chapel of Greenbush.